I begin with this. I, along with many if not most American Jews, understand the need for a just solution for the Palestinian people. I knew in the 1970’s, when the first settlements in the West Bank were established, that this was a disastrous path for Israel. They were letting right wing religious extremists in a door that should have been closed to them. Let me put this in more a personal light. On my first trip to Israel in the summer of 1971, a teen group tour, we were guests at a Palestinian community center where the guys played a basketball game against their team (we lost); then all of us shared a wonderful meal together. I doubt that experience could be duplicated today. How sad. So I, like many American rabbis, am critical of the Israeli government, often to the chagrin of some American Jews. I criticize the settlement policy, as well as many aspects of what happens in Israel, such as issues over religious pluralism, the dominance of the orthodox rabbinate, and the treatment of Israeli Arab citizens. We do not shy from looking into ourselves and voicing criticism of Israel. I see it as a religious duty to do this as a people and be honest about how Israel conducts itself. However, underlying any criticism I might have of the Israeli government is my commitment to the principle of the legitimacy of the State of Israel. I have studied its history. I have been there numerous times including living there for a year. None of my criticism is ever meant to undermine the legitimacy of Israel, but to apply pressure for it to follow the better, more idealistic course I have always believed it should and could. 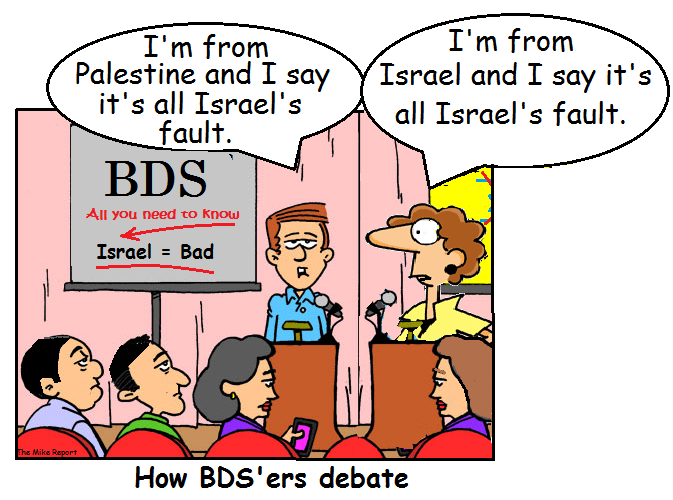 Now we confront the BDS movement. This calls for the boycott of Israeli products, be they commercial, academic or artistic. It calls for divestment of economic commitments to Israel by entities doing business or investing there, and it calls for sanctions to be levied against Israel, much like the sanctions that were levied in the 1980’s against apartheid South Africa. BDS proponents claim they are just looking for a peaceful way to push Israel onto the same path that people like me desire. It all sounds very good and righteous – until one looks at the details. First, the BDS movement aligns itself with campus organizations like Students for Justice in Palestine. Having appeared in a program with a representative of that organization, it is clear that this organization is not about justice, but revenge. Most important, this organization does not see Israel as having a legitimate right to exist. It excuses the most violent actions by Hamas by saying an oppressed people have a right to use any means at their disposal, including the targeting of innocents. Even more, SJP (at least the representative I was with) is completely unfamiliar with the history of the region. Her opening statement was “before 1948 Christians, Jews and Muslims all got along fine.” The implication here is that all of the problems began with Israel’s independence declared in 1948. There is no acknowledgment of a continued Jewish presence in Palestine from Roman times until the Zionist movement began in the late 19th century. While Jews were a minority in Palestine, they were there and at the end of the 19th century were even a majority in Jerusalem. Because of the historical inaccuracies embraced by BDS, they miscast the current situation of Israel’s occupation of the West Bank and treatment of the Palestinians as equivalent to apartheid South Africa. The current situation is the result of over 100 years of complex history. It begins with the purchasing of land by the early Zionist movement, often from absentee Arab landowners. The development of these lands had many scenarios ranging from local Arabs and immigrant Jews getting along just fine, to Arab xenophobia not accepting any Jewish presence in land that was once Muslim, to some European Jews acting like colonialists, determined to “civilize” the poor Arabs they found in Palestine. BDS proponents do not acknowledge the Arab massacres of Jews in the 1920’s nor do they acknowledge the virulent anti-Judaism of a significant part of the local population. For example, the Grand Mufti in Jerusalem in the 1930’s aligned himself with and even met with Adolf Hitler, declaring his full support of the annihilation of Jews. BDS proponents see no validity in the UN resolution of November 1947 that recognized there should be two states, one Jewish and one Palestinian. BDS proponents, when talking about Israel’s occupation of the West Bank in 1967 never mention this was a war instigated by the actions of Arab nations led by Egypt’s Abdul Gamel Nasser. BDS proponents do not mention that from 1948 to 1967 the West Bank was occupied by another nation, Jordan, as there was no acceptance in those years by Arab states for a two state solution. BDS proponents do not acknowledge that in the aftermath of the 1967 war, Israel offered numerous times to return all territories for a peace agreement. No, BDS does not acknowledge any of this history. For the truth, as sad and unjust as it might be today for Palestinians, is that the current situation arises from Israel’s success as a nation, overcoming vast economic and sociological difficulties to create a vibrant, dynamic economy, a high standard of living as well as the only state that resembles a democracy in the Middle East. The Israelis succeeded, and tragically, the Palestinians were never given the chance to succeed. Instead, their Arab brethren, in the years after the 1948 war, kept the refugees in displacement camps – an atmosphere calculated to incubate hatred not just of Israel, but of Jews. And that – hatred of Jews – is what BDS proponents seldom acknowledge as part of the ongoing problem. Yes Israel is far from a perfect actor in this. The building of settlements and the resulting oppression of Palestinians is just plain wrong. But it is not the result of the colonialism or racism that created apartheid in South Africa. Rather, it is the result of a struggle between two peoples, each pushing their own national liberation movement. Israel won, the Palestinians lost. As awful as the consequences might be for many Palestinians, this is NOT the same as what created apartheid. Rather, it is closer to the history of our country, the United States, and its treatment of Native Americans – with one huge difference, however. There has been a continuous presence (albeit a minority) of Jews in Palestine, while there were no Europeans living in the Americas before Columbus. The point really is that no one questions the legitimacy of the United States existence. We are critical of its history, and of the consequences of that history even today. It is equally legitimate to question the history and actions of Israel. No nation is perfect in its actions. But it is NOT right to question the legitimacy of Israel’s very existence. The next problem with the BDS movement is its connection to anti-Semitism. True, most of those drawn into the movement are not or do not consider themselves to be anti-Semitic. However, it quickly slides into anti-Semitism through its attempt to align other, very legitimate social justice movements to its cause. For example, BDS proponents have aligned with Black Lives Matter and declared that no Jew who supports the existence of Israel should be allowed to ally with Black Lives Matter. They then draw the comparison to South African apartheid, or even more of an outrage, to the struggle of African Americans in the United States. Conflating the problems of the Palestinians with the struggles of African Americans is a disservice to both. The histories of each struggle are very different and have very different origins. One is the result of conflicting national movements. The other derives from the history of American slavery and the resulting racism. Conflating these two struggles creates anti-Semitism among those supporting Black Lives Matter. According to this reasoning, any Jew who believes Israel has a right to exist cannot truly support movements in this country like Black Lives Matter. That becomes anti-Semitic. This point is reinforced by what is happening to Jewish students on campuses around the country. One example is that of a Jewish student at UCLA who was at first disqualified from being on student government because her being Jewish was seen as a “conflict of interest.” Is there any other religion someone can have that is considered a “conflict of interest?” For the full account read this http://www.thefederalistpapers.org/us/ucla-student-government-openly-says-student-shouldnt-serve-because-shes-jewish There are, unfortunately, a growing number of similar examples, in which Jewish students are singled out on the assumption they are pro-Israel – which frankly should not be an excuse anyway. Pro-Israel has a wide range of definitions, which do not necessarily include blanked support of all Israeli government policies. BDS takes its aim at exactly the wrong elements. They oppose Israeli artists, musicians and academics as propaganda tools of the Israeli government. They oppose Israeli businesses as well as those American and international corporations that wish to invest in Israel, declaring them as exploitative of Palestinians. When artists, musicians, academics, and businesses are targeted, the very folks who are the natural allies in creating a different reality between Israel and Palestine become alienated. Rather, they need to be enlisted. The cooperation of business is necessary in order to create economic opportunities for Palestinians to lift themselves out of an awful situation. The only way to create justice in Israel and Palestine is by creating a non-violent alliance between Israelis and Palestinians who are dedicated to a just solution. Rather than trying to create positive connections between groups, those supporting BDS, willingly or unwillingly, are just driving more wedges between the people of the region, thus creating more bitterness and divisions. The creation of peace between Israelis and Palestinians is a long, hard process. It has started and stalled numerous times over the century since the beginning of the Zionist movement. The only way to start a process that has any hope of success is for those who care about Israel and Palestine to shut up and just listen to each other’s narratives – not always to agree but to learn to understand the background and concerns of each other. By focusing on Israel as the villain, and by ignoring Arab anti-Semitism, those pushing BDS simply add to the poison already in the atmosphere.